The overshot wheel is the most common wheel seen in North America. It is a gravity wheel. This means that it harnesses the force of gravity acting vertically on the water as it travels from the top to the bottom of the wheel. Properly designed for a particular site, and correctly timed, an overshot wheel can slow the natural velocity of the falling water to as little as 10% of what it would be if the wheel was not there. The overshot wheel is most effective when it turns as slowly as possible and can still handle the total flow of water available to it. The optimal rim speed should be only about 3 feet per second. The larger the wheel the slower it will need to turn. The incoming water must be traveling about three times the rim speed of the wheel so that it can fill the buckets effectively. This requires a foot or more of head above the wheel, usually controlled by a gate. To prevent dragging during a flood period the wheel must be mounted at least a foot above the tail water. The buckets start spilling water well before reaching the bottom. This along with the sacrifice of two or more feet of head above and below reduces the efficiency of the wheel to 70-90%. One would need a 12 ft. or higher fall in order to use a 10 ft. wheel. Over shoot wheels have been made as high as 70 ft. but most are no higher than 30 ft. The overshoot wheel will work as well today as it did a hundred years ago. When the head, or fall of water was not sufficient for a large diameter overshot wheel, the breast wheel often is used. This is halfway between the overshot and undershot wheels. Water strikes the buckets of the breast wheel about midway between top and bottom, using the weight of the water for a 90 degree segment of arc. While more efficient than the undershot, their efficiency is far less than the overshot, which uses the weight of the water for a full 180 degrees. 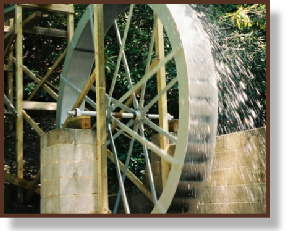 This type of waterwheel relies on the flow of water, coming along the base flowing at a good rate of speed to push or thrust the waterwheel. 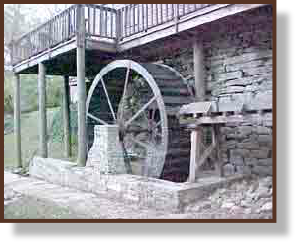 This type of waterwheel is used on mills built on rivers or streams that do not have any height or (head). Undershot wheels are normally narrow and have to have the channel walls very close to the sides of the wheel to maximize the flow of water to pass through the wheels to generate power. This type of wheel is generally the least efficient type of wheel - usually in the 30-50% range. 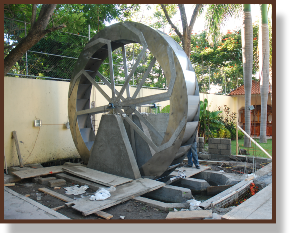 The exception to this is the Poncelet wheel that can get up to 80% efficiency if the channel is properly constructed and the buckets are designed right.